Tomato Salsa and Salsa Verde. 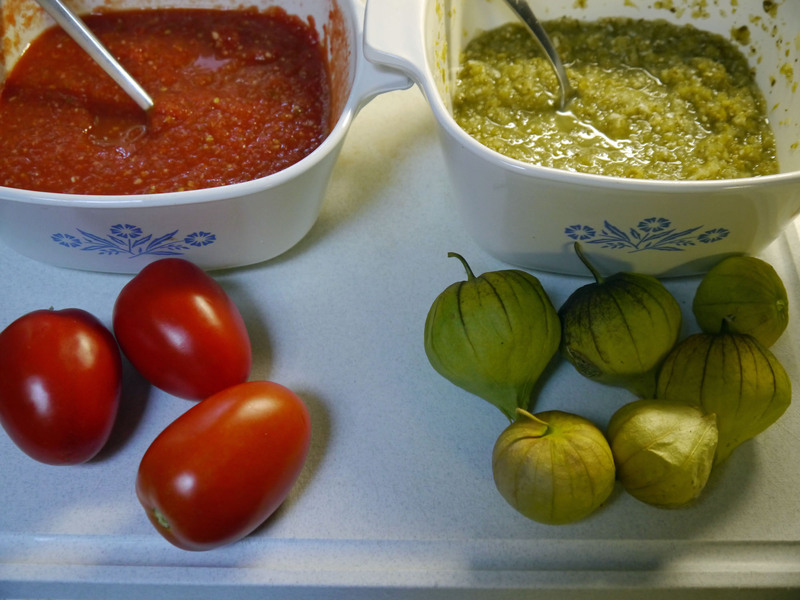 This summer I grew tomatillos and made a great Salsa Verde. At the same time I made some traditional Red Salsa from the Roma tomatoes in the garden. This is a cooked salsa and closely approximates the salsa we are served at our favorite Mexican restaurant. The trick is to peel the Roma tomatoes. I’ve used canned tomatoes and it’s almost as good. In fact you are probably better off with good canned Roma tomatoes than the typical anemic Roma tomatoes that you find in the grocery stores off season. 1 ½ lbs. (Approx. 8 large) Ripe Roma tomatoes or canned whole peeled Roma tomatoes. If you are using fresh tomatoes, wash tomatoes and slice off the stem end. Cut an “X” through the peel on the other end. Put the tomatoes into rapidly boiling water. Leave them in a couple of minutes until the skin starts to split and remove them with a slotted spoon. Let them cool a bit and then pull off the skin. Place peeled tomatoes or canned tomatoes, garlic, and oregano into a food processor. Process until pureed. Place the mixture in a heavy pan over high heat. Finely chop 1/2 onion and 2 jalapenos in the food processor and add to the pan. Bring to boil, then reduce heat to medium-low, and simmer until the mixture starts to thicken, about 15 - 20 minutes. Remove from heat. Cool and then add cilantro and salt to taste. Add additional chopped jalapeno and onion to taste. I've used canned tomatoes and it's almost as good. In fact you are probably better off with good canned Roma tomatoes than the typical anemic Roma tomatoes that you find in the grocery stores off season. I found some tomatillo plants at the garden center this spring and planted them in the garden, specifically because I had never used tomatillos in cooking and I knew that this would force me to do it. The plants produced prolifically and i perused the web a bit and combined and modified a couple of recipes and came up with what everyone thought was a pretty good Salsa Verde (Green Sauce). We used it as a dip with chips, but it could be served over chicken or other Mexican recipes. Husk & wash tomatillos. Place tomatillos and garlic into a food processor. Process until pureed. Finely chop 1/4 onion and 2 jalapenos in the food processor and add to the pan. This is a healthy, south-of-the-border-favorite. Freshly made guacamole is a real treat. The secret is getting ripe Avocados that are not too ripe. Ripe Avocados will be darker colored and will feel slightly soft when squeezed. Over-ripe Avocados will feel mushy. Soak the onions or shallots and the garlic in the lime juice with some salt in a large bowl. This will avoid the bitterness that they can sometimes cause. Cut the Avocados in half lengthwise and remove the seed. Scoop the Avocado out of it's skin with a spoon and add it to the bowl. Mash the Avocado with a fork or a potato masher. Use the fork to mix in the rest of the ingredients. The tomato, cilantro and jalapeno can be omitted if you don't like them. I personally feel that tomato and cilantro are necessary, but make it the way you like it. Quantities listed here are a starting point and can be varied according to your taste.